Parking: There is some parking at La Rocque, although it can become quite busy on summer days, particularly on neap tides, when the tide will be high about lunch time. Seymour Slip just to the north is an alternative. 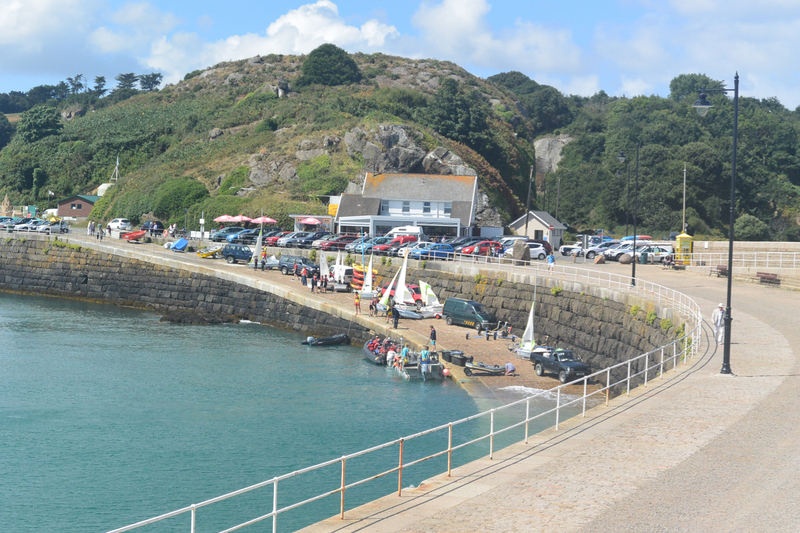 Further along the Royal Bay of Grouville there is a large car park at Long Beach, just south of Gorey. There is parking in all the small bays heading north, although it can be limited. St Catherine’s has plenty of parking and an easy launch from the slip, unless there is a strong wind from the south. Refreshments: There is a small kiosk at La Rocque, the Seymour Inn serves good food and beer. Further north, just before Gorey, opposite the Bass and Lobster Pub, there is a slip way where it is easy to land and a great little kiosk, Rhona’s at the Beach, for food and drinks. If you decide to land in Gorey, beware on a falling tide, as you may end up with a really long walk, there a number of eating and drinking establishments to suit all pockets. To the north of Gorey there are cafes at Archirondel and St Catherines, both of which offer a range of food and soft drinks. La Rocque viewed from the air. There are plenty of opportunities for kayaking through the gullies, which appear and disappear with the movement of the tide. La Rocque Harbour marks the south east corner of the Island and the start of some fascinating kayaking. At low water, on spring tides, the water can recede nearly 2 miles, so planning is pretty essential. Offshore Seymour Tower is clearly visible. Constructed in 1782, the year after the French invasion and the Battle of Jersey. Reaching the Tower by kayak often requires the ability to ferry glide across tidal streams. Continually refer to your transits to ensure that you aren’t loosing ground. Landing at Seymour Tower at high water is not that easy as the steps rise straight out of the water. It is well worth a visit though because of the unusual views it offers of the south and east coasts. A small paved area provides an ideal picnic spot, one day I shared my sandwiches with a small group of Goldcrests, so you never know what might appear. Seymour Tower gained national fame in 1987 when two horses and their riders became disorientated in the fog and had to spend the night on the tower. Luckily the sea wasn’t rough that night and both horses and humans survived the ordeal. It is now possible to remain at Seymour Tower in much more organized circumstances, as it can be booked for the night through Jersey Heritage. It is necessary to be accompanied by a qualified guide but some of them are also kayakers. Arriving at Seymour Tower just before the last of the sand banks disappear. The rocks continue to the south of Seymour Tower. The beacons and cardinal marks, which are found in this area, provide excellent navigation exercises. La Conchiere Beacon is an interesting place for a rest, with Jersey seeming extremely remote. The long serving bent beacon was replaced in 2011 with a South Cardinal Mark. Further to the south is the Canger Rock cardinal mark. In the large pools, which are uncovered in this area, keep an eye open for grey seals. It is one of the best locations in Jersey to see them. They are never very numerous but always welcome. In addition Bottle Nose Dolphins may break the surface, adding further quality to what has probably already been an excellent paddle. 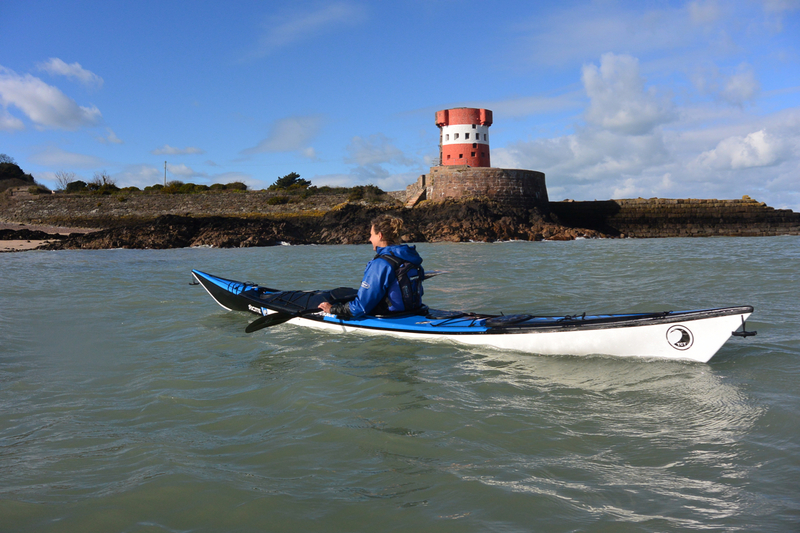 The more adventurous paddler could head out towards the Grande Anquette beacon, which is about 4.5 nautical miles from the slip at La Rocque. The Jersey coastline has lost much of its detail and even Seymour Tower looks distant, when sitting at either of the two Anquette beacons. At high water none of the reefs break the surface and there is a real sense of isolation. The maximum rate of flow of the north running tide appears to be about 1 hour after high water St Helier, so it is likely that the return paddle to La Rocque will be slightly easier than the outgoing paddle. The Grand Anquette beacon is some distance offshore. Paddling here you are likely to feel very isolated particularly as the tidal steams swirl around the beacon. Heading north from La Rocque the view is dominated by the graceful lines of Mont Orgueil Castle, which looks out over Gorey. The Royal Bay of Grouville, is a broad expanse of sand at low water, with some of the shell fish farms exposed. Towards high water it is effectively a paddle parallel to the coast, with a few places of historic interest. It is mainly a bay that is paddled across whilst undertaking a longer journey, rather than explored in its own right. The proximity of France has led to the bay being heavily fortified in the past with a large concentration of Jersey Round Towers, especially in the southern portion. During the winter months a paddle in the bay is made more interesting because of the variety of birds, which congregate in this area. Brent Geese and Red Breasted Mergansers are common and if one is lucky the flash of a Kingfisher in flight may be seen, as well as a good variety of waders. Gorey is a pleasant village with its harbour providing shelter for local and visiting yachts. Mont Orgueil Castle has experienced turbulent times and in 1373 it was the only part of the Channel Islands not under the control of the French. By the late 16th Century though it had outlived its usefulness and had been replaced by Elizabeth Castle as the main castle in Jersey. Today the castle, is a major tourist attraction and the views from its summit are superb. They stretch from Chausey in the south, past Seymour Tower and north towards the Ecrehous and the Normandy coast. All excellent paddling waters but they are for another day. At night the castle is floodlit and looks particularly attractive. Its lights are clearly visible from the Ecrehous on a clear night. Gorey village grew rapidly in the 19th Century and this development was linked to the oyster beds that were present offshore. In 1830 around 2,000 men plus hundreds of women and girls were employed in the industry. Oysters were so cheap in Jersey that they were served free in the local hotels. By the middle of the century though the industry was finished due to over-fishing and disease, in its place shipbuilding developed in the area. Today Gorey is a pleasant, although at times busy village, with a variety of shops, pubs and restaurants and is well worth a visit. The easiest place to launch in Gorey is from a slip several hundred metres south of the harbour, opposite the Bass and Lobster Pub. The older kayakers among us will remember when it was known as The Welcome slip, after the pub of the same name. Parking is possible nearby with a particularly large car park about one hundred metres further south. Launching is not really possible at low water on springs in this area but is an ideal location for a gentle evening paddle at high water. 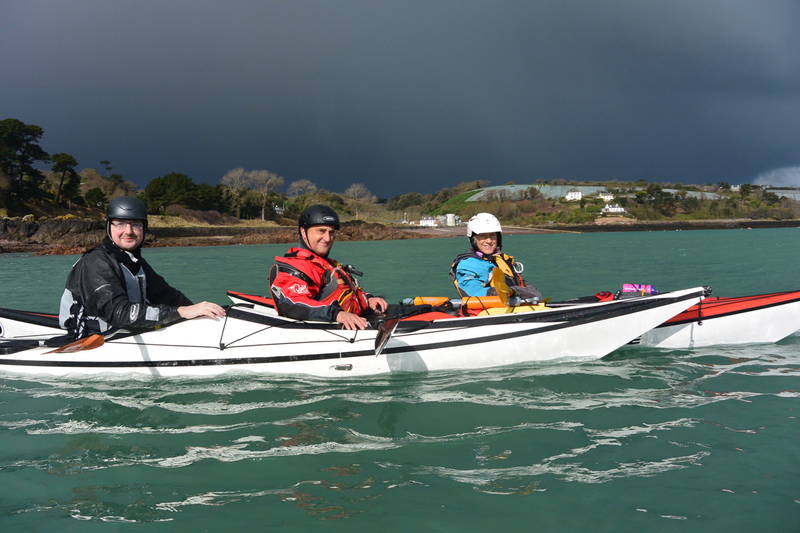 North of Gorey the coastline begins to change in character becoming more interesting from a paddlers point of view. 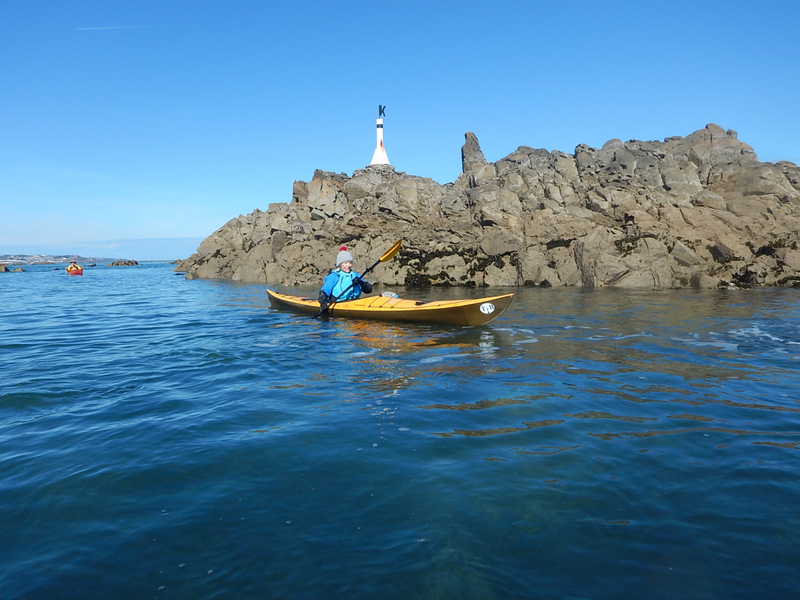 This area of Jersey is probably the most suitable on the Island for the beginner or the relatively inexperienced paddler. The upper sections of all the beaches are also relatively steep so it is possible to launch at all stages of the tide without having to walk too far. The first bay to the north of Gorey is Anne Port. Parking is allowed on the northern side of the slip but during the summer an early arrival would be needed to guarantee a place. There is a fairly large car park just up the hill on the main road towards St Catherines. It is a sandy beach and a convenient starting place for a short paddle round to Gorey, which provides spectacular views of Mont Orgueil Castle in all its majesty. 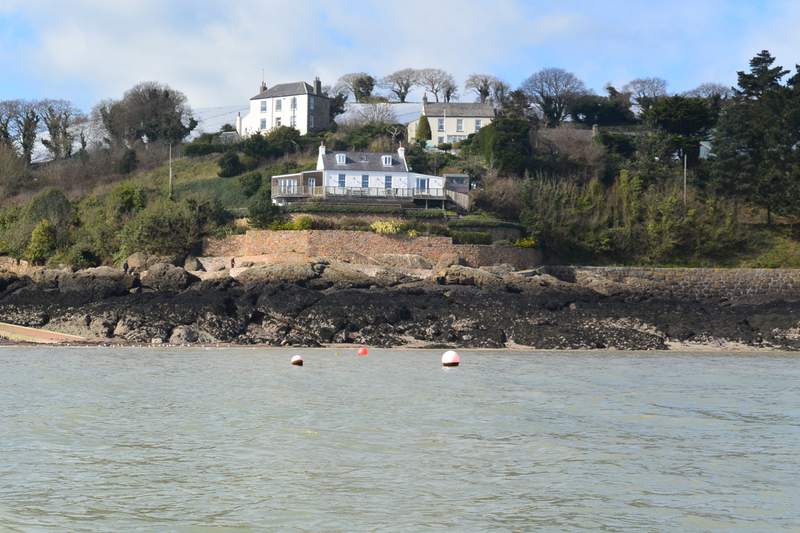 The rocks to the east of Gorey, many marked by beacons such as Les Arch, Equerriere Rock and others closer inshore are the site of some interesting tidal streams, particularly when the tide is flowing north. Their speed often catches paddlers by surprise. Looking towards St Catherines from the top of Mont Orgueil Castle. A perfect day to be on the water. After Anne Port, Archirondel, the next bay to the north, with its small car park it is another good place for the start of a short paddle. Archirondel is easily identified by the Round Tower, with its distinctive red and white colour scheme situated on small breakwater. The tower was used by a local youth club for a number of years but is now run by Jersey Heritage. When it was built at the beginning of the 19th Century it was on a small offshore island and the embankment running out towards it was added later in the century as part of the St Catherines Harbour development. The unfinished remains of the harbour wall can be seen on the seaward side of the tower. The friendly cafe is an ideal place to relax after a paddle. In between Archirondel and St Catherines there are a couple of small launching spots. Near to the lifeboat station there is a slipway, known locally as “Mike’s Slip”, which can be used at most stages of the tide. Just to the north of the slip the small white house was used as a hospital during the construction of the breakwater, hence its name “L’Hopital”. Underneath the house the small cliffs have had to be reinforced, evidence of ongoing coastal erosion. Carrying on towards St Catherines there is another small slip at Bel Val with a car park on the opposite side of the road. It is St Catherines Breakwater, which dominates any view of this bay though. It is the remains of a 19th Century project by the Admiralty to build a large naval harbour. Never used for the purpose for which it was designed it now provides shelter from northerly winds and the main tidal flows. 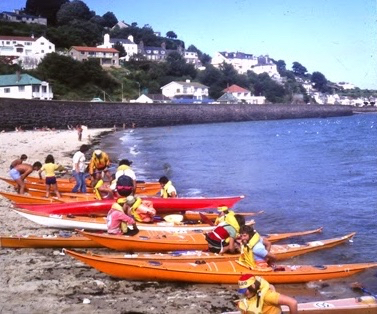 A popular fishing and dinghy sailing venue it is the location of the clubhouse of the Jersey Canoe Club. 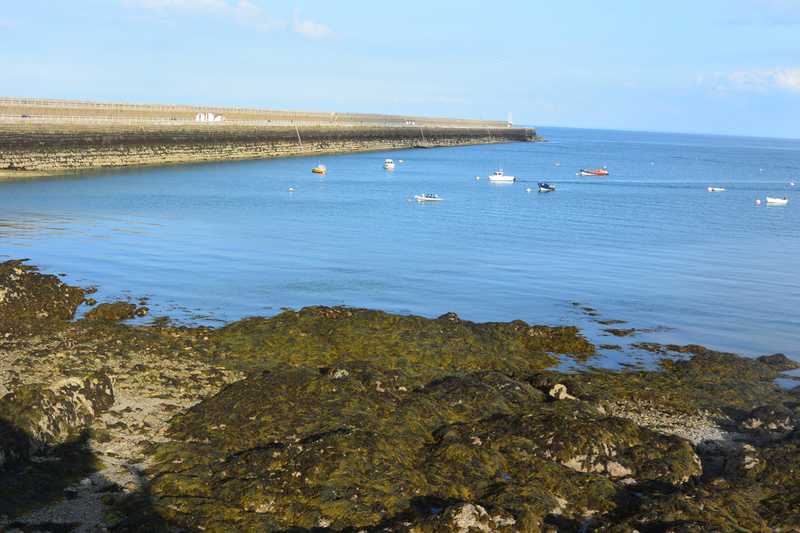 Situated in a former lifeboat station it is at the southern end of the car parking area at the breakwater. From the middle of April onwards on Tuesday evenings the members of the Club can be found paddling in the area as it is the regular meeting place. It is also in frequent use during the day and at weekends with school groups, youth groups and the many courses that are run by the Canoe Club during the year. Slack water occurs at roughly mid-tide. Care needs to be exercised off the end of St Catherines Breakwater, especially during Spring Tides. The speed of the water running through the reefs just offshore from Mont Orgueil Castle catches some people unawares each year. A busy afternoon on the slipway at St Catherine's. Low water. The breakwater provides shelter for a range of water activities. 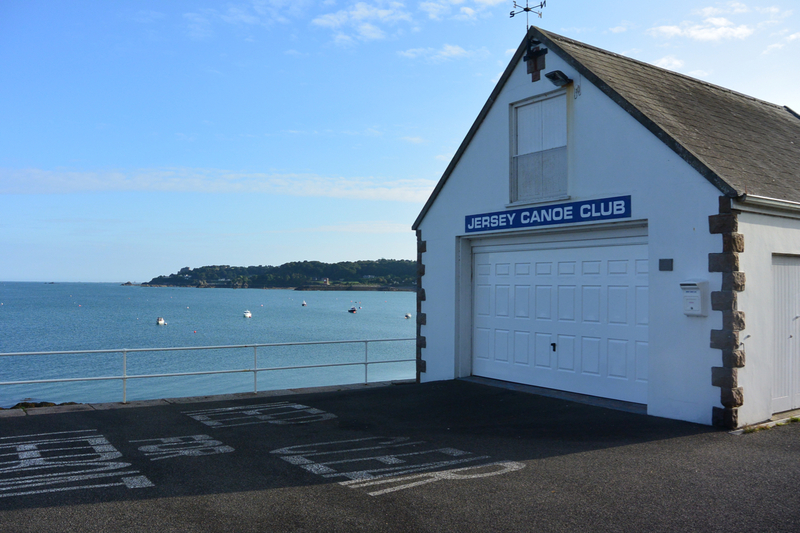 Jersey Canoe Club has a building ideally suited for access to the water at St Catherine's. Built initially as a hospital for the construction workers from the breakwater, the lower white cottage is now a holiday let. Built in 1792 the tower at Archirondel is now available as a holiday let from Jersey Heritage. An approaching storm as we paddled off the east coast of the Island. Great quality to the light. 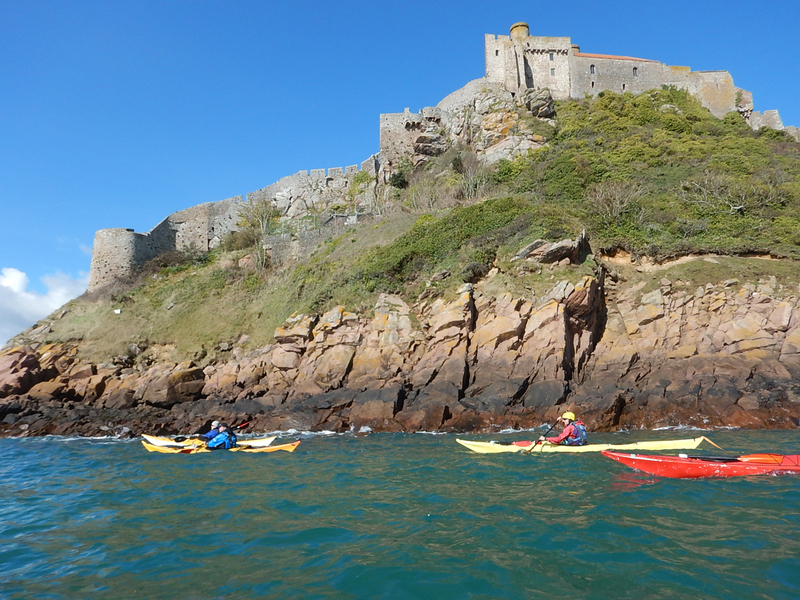 Paddling underneath the ramparts of Mont Orgueil Castle is always impressive. Karame Beacon, one of the many beacons to the south east of the island. 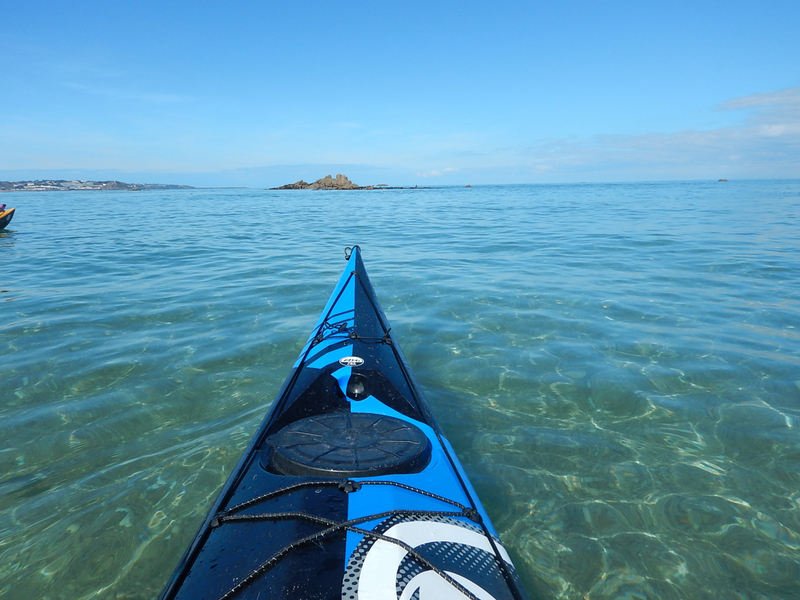 Superb conditions for exploring the reefs to the south east of Jersey. The start of the JCC Middle Distance race in 1979. Orange Nordkapp HM's were the dominant kayaks.